i came home on Friday to find patch 5.0.4 downloading. Going back to Catacylsm - the pre-Cataclysm patch took away the ability for Ink of the Sea to convert to other inks via the Ink Vendor. That was not critical given Ink of the Sea was still the most popular ink for Inscription. However, Blackfallow ink is only used for one glyph / 6 scrolls / 1 book and therefore i dont want to be left with many. Indeed, given i can use my Herbalist to gather whiptail i dont want to be left with any. Hence, i have converted almost all of my spare Blackfallow inks into Ink of the Sea and Ethereal Ink. And i have milled all my Catacylsm herbs. 134 BLackfallow inks to be converted = 44 glyphs. 1927 ink of the sea = 642 glyphs. Target is done. 1002 ethereal ink = 334 glyphs. Target is 350 glyphs worth. 686 Midnight ink = 229 glyphs. Target is done. 678 Jadefire ink = 226 glyphs. Target is done. 658 Lion’s ink = 219 glyphs. Target is 350 glyphs worth. 641 Shimmering ink = 213 glyphs. Target is done. 471 Celestial ink = 157 glyphs. Target is done. i will be keeping an eye on the Auction House - there is a decent chance that Catacylsm herbs are dumped for low prices over the next few weeks giving me a chance to quickly buy them and convert to other inks, if that opportunity still exists. and i will be keeping an eye on information out there to further fine tune my perparations. What is your target exactly? You are mentioning 'target is done' but is this for all glyphs and if so how many of them? its a rough and ready estimate from myself. I operate with 8 of every glyph aready crafted and aim to hold 2 weeks worth of inks (so that varies with demand). i estimate that Mists of Pandaria will increase demand via a new class (Monk), people levelling Panda's and naturally returning players. there are about 33 glyphs per class so i will need enough inks to craft for the new monks and new pandas - and also remembering that my competitors will be doing the same. however, i suspect many of the new monks and pandas wont be buying the glyphs immediately and indeed by the time they start buying in bulk the new herbs will be in better circulation. Hence, i suspect (and i am guessing now) that demand will initially rise sharply and then slow to double the normal rate for a small while before settling to a normal steady state. Hence, i am aiming to hold 4 weeks worth of todays demand after catering for a short initial spike. . . . . . . admitedly it is all guesswork, but if demand really flies then the price of glyphs will rise sharply allowing good profits to be made on the rising herb prices in response. What would be the right time to sell? When MoP goes live or when the pre-patch event starts? atm i haven restocked a thing and only selling some glyphs i still had lying around. the Cataclysm pre-patch was the right time in 2010. This time, though, it could be mixed. Certainly when Panda's and Monks are introduced. But if Blackfallow is taken away as the cnoverting ink in the pre-patch then that will be a good time also given glyph supplies will start to run low. 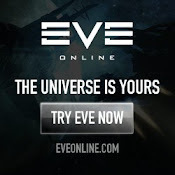 Also, the pre-content patch may spark further old players returning so increasing demand. did glyph chnages starts on panda or inc patch ? u want to stockpile inks ? not doing a glyphs out of it atm ? I believe it will be around 10000 or 500 stacks of whiptail. It could be cheaper to use other herbs rather than converting every single one from blackfallow. think in terms of glyphs (1 glyph = 3 inks, 1 glyph = 10 herbs). In Mists of Pandaria there will be c380 glyphs in the game. 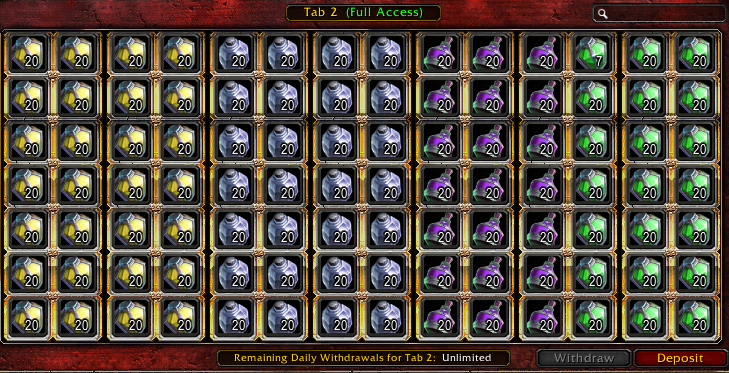 i aim to stock 8 of all of them (though i know many will not sell at above my 40gold threshold). so, i need to carry enough to hold 380 x 8 = 3040 glyphs = 9120 inks (if i was starting from scratch). also, if you are stocking whiptails, i would be milling them to Blackfallow now and converting the Blackfallow inks into other inks before that ability is taken away. I dont know for sure when the glyph changes will start, or indeed when Blackfallow ink will no longer be able to be converted into other inks. for Ethereal / Ink of the Sea: when i look at how my sales have gone in the past - these have been the ink types of which glyphs have sold the most. so the ratios i am using are in line with my historical sales rates. There are other blogs which have looked at this in more detail. I would especially not be short of ethereal ink - these herbs are always in short supply. once i have 8 of all glyphs i always stock pile the inks in preference. gives me more flexibility. So far I have stockpiled 9197 various types of inks. I don't know if this will be changed or not when mop actually comes out, but I was looking at the monk glyphs on wowhead and it looks like 13 of them will take Ink of the Sea to make. 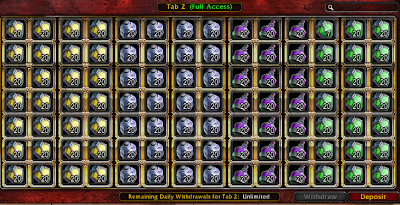 So I'm stockpiling a lot of Ink of the Seas just in case. @GrayzBDF: yes, hopefully. i just bought a truck load of very cheap catacylsm herbs that someone dumped on the auction house. Do you farm herbs to make inks? Or do you buy herbs at cheap prices? Also I found out that on my server glyph market is VERY competitive. As soon as I'd post some glyphs, I'd get undercut immediately and then again it's time to cancel auctions, run to mail box collect my glyphs reposting them. Is there an addon that can repost for you?